With a small baby in the house I want something to watch that can be stopped every 15 minutes or so. What better than a show where each episode only lasts 15 minutes? And for that it is perfect! It also tells the story of an early international marriage in Japan (circa 1920). Another plus! But, well, the quality is what a grumpy person like me would expect from a daily Japanese television show. What does that mean? I get into it below. Quick Review: It is important to state that this is based on the first 6 episodes of a daily serial that goes on for 150 episodes. Because of that I am willing to go with certain aspects that seem to be part of the parcel. The story telling goes rather slow. A narrator brings us up to date throughout the episodes. Things constantly cover the same information so that if an episode is missed you can pick things up without missing much. And with all that in mind it is a decent story. Or at least a story that we can get involved in. A spouse changes cultures and countries to find love. How sweet. But at the same time, the acting and presentation leaves a lot to be desired. Basically it is at the level one might expect at a junior high drama club. Maybe high school. But then again, it is a soap opera for all intents and purposes. Maybe that should be expected? Analysis: Let’s start with the acting. As with a lot of Japanese movies/television I find myself more pleased with the older generation. Of course, they can be a bit formulaic in their character recipes, but at least they tend to fill the gaps with reactions and moments of build and fall. You know, acting. The two main cast members, Tetsuji Tamayama as Masaharu and Charlotte Kate Fox as Ellie, tend to do a lot of staring and waiting for their turn to say something. So far I’m not really feeling any chemistry between them. 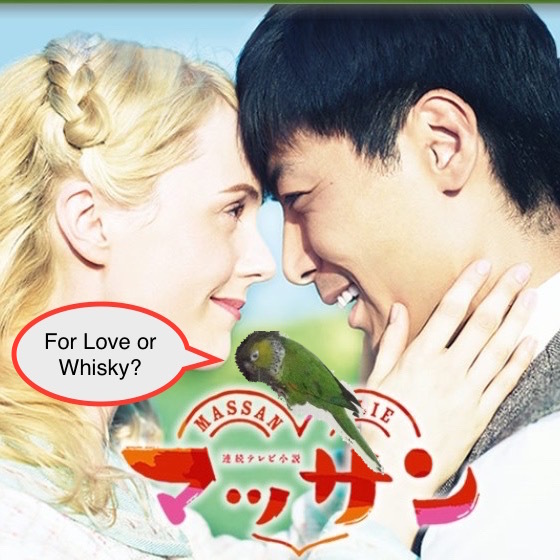 It doesn’t help that the character of Masaharu seems more interested in getting his whisky business started than making his wife feel welcome in his country. I mean, he tries, kind of. But the conversation tends to go back to whisky. Makes me wonder if that was his motivation for bringing this girl, who I think is portrayed as being from a whisky family, back to Japan. Another aspect of the show is that the background music adds nothing. I imagine it must be composed for the show, but it feels as is the same effect could be accomplished by pulling up some public domain light classical and just slapping it on. I guess I should be glad it hasn’t felt repetitive yet. The good is that it doesn’t get to the point where it is distracting due to a lack of quality. But saying it isn’t offensive to the senses is hardly praise. This is the first time a non-Japanese person has had a starring role on TV (at least this type of TV series, although I can’t think of another starring role. I’ve seen a few hafu, but never a non-Japanese in a starring role.) This makes this a kind of important role. But that also opens up a few doors. These first few episodes are all about pointing out the little social awkward moments that would arise. And they are pretty trope. Ellie can’t use chopsticks, can’t sit seiza, walks inside with shoes, runs around hugging everyone, etc. I’m sure this is to make her look out of her element, but all I can think is didn’t her husband give her any warning? There is also no subtlety in these gaffes, so while they are natural mistakes, to an extent, it does come off as weak writing. What makes these moments odd is that language is not really an issue in the world of the show. Ellie speaks Japanese, although slowly and with an accent, and has yet to have an issue with understanding those around her. I’m sure the reason is for the audience, but it does feel odd to have her stumble through simple mistakes (take off shoes inside) and succeed at harder areas (hold conversation with aggressive mother-in-law who speaks heavy regional dialect.) Fox speaks her on Japanese, a language she learned for the show, but there is the oddness that in flashback episodes where she is speaking English she is overdubbed by a Japanese actress. I’m not pushing for subtitles, although they are an option, but it is odd to have Fox carry on her own Japanese conversation in the present but having another actress dub her in the past. This is by no means a great show. But it isn’t a bad show either at least when compared to what else is out there. I’m just going to say it: Generally speaking modern Japanese drama suffers from a lack of quality. Of course there are projects which are exceedingly well done, but those are the exception. Most of what I have seen are poorly acted, cookie-cutter directed, overly staged works with poorly written cliched plots. And Massan does fall into a lot of those categories. But it hasn’t been that egregious, yet. But to be honest I think the big plus is rather than a single episode carrying on for 50 minutes (which generally brings out a lot more of the weakness to the front) the 15 minute run time keeps the show in nice little bites. Easy to get a little digestible story without all the excess. I’m going to keep watching to see how the international marriage angle keeps going but also because I am starved for Japanese language drama that passes into the realm of tolerable. Interesting points about how the show almost forces Ellie’s character to make “foreigner mistakes”. I remember watching Japan Foundation’s language course, Erin’s Challenge, and how the main actress is a Japanese-native hafu whose portrayed character is an American exchange student. She spoke fluent Japanese, and was able to read the kanji names for Kyoto Temples… yet does not know what takoyaki is, and commits social faux pas that were too obviously scripted in.